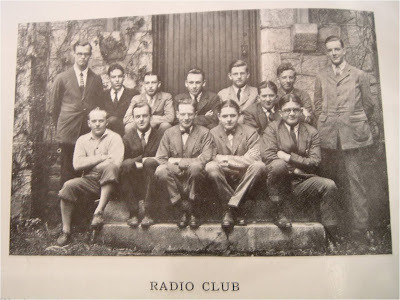 Photo of Radio Club from Haverford College yearbook "The Record of 1924"
It would probably surprise most people to find out that college radio dates back to the 1920s. As Hugh Richard Slotten points out in his new book Radio's Hidden Voice, this early history of college radio has been largely undocumented, even though radio stations at universities, "...pioneered some of the earliest experiments with radio in the United States..." In fact, the 1920s were boom years for college radio, with at least 90 college radio stations in operation by January 1924, including WABQ at my alma mater Haverford College. In this article (the first in a series about the history of radio at Haverford College), I'm going to share radio station WABQ's early history from the 1920s. Subsequent pieces will look at how radio at Haverford evolved decade by decade (transforming into WHAV, then WHRC) and will include stories from former DJs and staff members. The 1920s were truly the heyday for radio at Haverford College, at the time a small, all-male Quaker College on Philadelphia's Main Line. Around 1920 a radio club began on campus and the first radio station, WABQ, was launched by students in 1923. Located on the third floor of Sharpless Hall at Haverford, WABQ began in grand style with the installation of a steel radio tower just before the beginning of the school year in fall 1923. Soon after WABQ was launched, they embarked on a series of ambitious projects that brought fame to both the station and the campus. 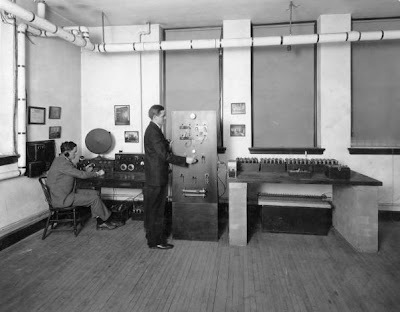 On February 10, 1924 members of the Radio Club were conducting wireless experiments and succeeded in communicating by Morse code with students in London, Montreal, Maine, Nova Scotia, and Pittsburgh. According to an article in the New York Times this event was "understood to have been the first time that educational establishments in America and England have talked to one another by the means of wireless." "The Club is proud of its wireless equipment and the records it has hung up. To date the telegraph signals have been heard in England, Hawaii, Porto Rico [sic], Maine, Texas, California, and Washington." "The Club secured a broadcasting license WABQ and the broadcast programs have been received from Maine to Michigan. Many entertainments have been transmitted which include speeches by members of the Faculty, music, (classical and dance), scores, etc. Hundreds of cards have been received from pleased radio fans attesting to the popularity of WABQ. Only the highest class programs in keeping with the ideals of Haverford have been sent out. WABQ is a good publicity agent. Altho funny as it may seem the Radio Club has had more space in the newspapers than all of the Haverford teams together." "This year an Intercollegiate Radio League was formed which included all the large universities and colleges. Haverford was one of the charter members. The League hopes to be useful to managers of the sports in arranging schedules and also to the college newspapers in reporting games, etc." As a testament to these accomplishments, the 1924 article concluded with the line: "The Haverford College Radio Club is helping to put Haverford on the map." This is an amazing statement about the radio station's success in the 1920s. Unfortunately that level of acclaim was to be short-lived and the story of WABQ's accomplishments has not been documented. Every few years a Haverford College publication will reveal bits and pieces of the station's history, but the full story is largely unknown to people on and off campus. 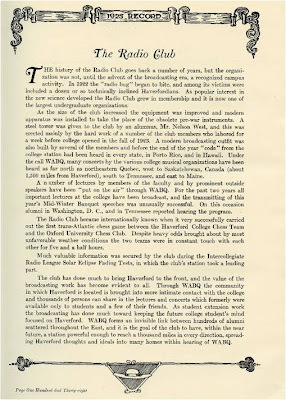 The 1925 Haverford College Record article on the Radio Club states, "...the Radio Club grew in membership and it is now one of the largest undergraduate organizations." It also mentions that the station aired concerts by campus musical groups and that these broadcast were heard as far away as 1500 miles from the college. Additionally, lectures and speeches were aired on the station. 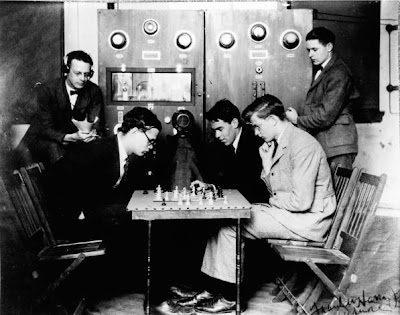 Most famously, in December 1924 Haverford received a great deal of attention when it participated in the "first international chess match by amateur radio," with Oxford University according to the New York Times. In these early years, WABQ worked with other colleges to conduct various radio experiments through the Intercollegiate Radio League. One such experiment happened in 1925 when they worked with students at Harvard University to test the effects of a solar eclipse on radio transmissions. "WABQ forms an invisible link between hundreds of alumni scattered throughout the East, and it is the goal of the club to have, within the near future, a station powerful enough to reach a thousand miles in every direction, spreading Haverford thoughts and ideals into many homes within hearing of WABQ." "A 1000-watt transmitter, the most powerful college radio installation in the United States and second only to KDKA among the Pennsylvania stations is now nearing construction at Haverford...the station is hoping to establish a range in excess of three thousand miles." "WABQ stands unique among American radiocasting stations in that its design, construction, and operation in their entirety are carried on by undergraduates majoring in scientific work at Haverford." The piece also mentions that WABQ was planning future chess matches, including one with a college in New Zealand. An article in the New York Times adds that a chess match with University of Paris was scheduled to begin January 18, 1926. In 1926 Haverford station WABQ is listed among the college stations cited as members of the College and University Association of Broadcasting Stations. The 1926 Haverford College Record again recounts the station's accomplishments, giving much credit to Williams S. Halstead for his work to both raise funds from alumni to build the original 50-watt station. The Record article states, "From this small beginning, gradual improvements were made, weekly programs were instituted and WABQ, the College call letters, became known over a wide range of territory as coming from the 'first college broadcasting station in the East.'" And, indeed, the power did get boosted with the help of the manager of the Ardmore Theater and the Record reported that the station was now at a "750-1000-watt capacity, thus giving it a power exceeded, in Pennsylvania, only by KDKA, in Pittsburg." But (you knew this was coming).... by 1927, WABQ became a victim of its own success. A January 2, 1927 piece in the New York Times reported that WABQ was discontinuing its broadcasts. Although the Radio Club was successful in attracting more members (reportedly around 25 members compared with a handful in the early days) fame, and listeners; it also was being courted by commercial interests. They had a powerful transmitter and this was very appealing to commercial stations who were trying to gain a bigger slice of the radio dial. This was apparently not uncommon at the time. In Radio's Hidden Voice, Hugh Richard Slotten argues that, "...by 1923 competition with commercial stations was inhibiting the establishment of university stations..." He also points out that "Commercial stations aggressively worked to convince colleges that private stations would provide all the airtime they needed free of charge." "...in December, 1926, an attractive offer was made to the club by the Keystone Broadcasting Company. Though loathe to part with the station, it was deemed advisable to sell it at the time mainly because the men who had built and operated the apparatus were to graduate in June, and the continuation of the broadcasting activities would be in doubt. Accordingly the station was sold and removed to its present location atop the Lorraine Hotel, in Philadelphia, where it has become one of the foremost commercial stations in the city." Through this deal, WABQ was sold to WFAN (The Keystone Broadcasting Group). 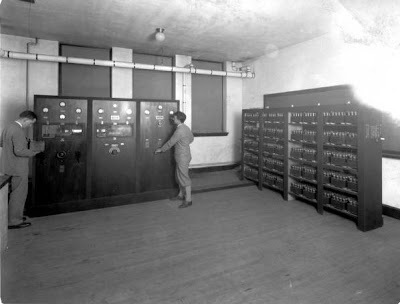 At the time many stations were forced to share frequencies on the radio dial and according to an article on Philadelphia Radio Archives, by 1928 WFAN was sharing the frequency of 610 kHz with WIP (which began broadcasting in 1922). Eventually WFAN was purchased by WIP in 1931 and it's now a CBS-owned station. As articles in the Record and elsewhere point out, Haverford was allowed to continue broadcasting for once or twice a week from the new station WFAN and they also kept the radio towers that they had installed on campus atop Sharpless Hall. As one might have predicted, by 1928 radio was relegated to a list of "minor organizations" in the yearbook. The blurb states, "After the removal of the broadcasting station, WABQ, radio at Haverford suffered a decided relapse." However, students in the club continued to offer "code classes." 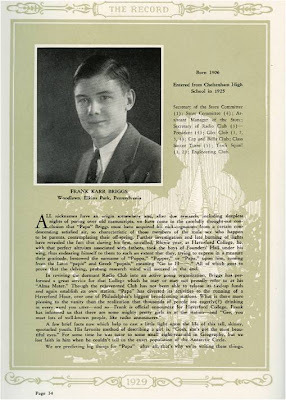 A 1929 profile of Haverford student Frank Karr Briggs in the Record pointed out that he was working to get a radio station up and running again on campus. The article stated that he had [revived] "the dormant Radio Club" and was "running...a Haverford Hour, over one of Philadelphia's biggest broadcasting stations." An article about the Radio Club adds, "Several fine programs were sent on the air before the Club's use of the station was cut off by an unfortunate circumstance..."
Indeed the Haverford Radio Hour on WFAN in Philadelphia (as promised by the station when WABQ was sold to them) was short-lived. An article in the 1930 Haverford College Record stated that the show aired for one hour every week, but that "when the novelty died out, the broadcasting did also." 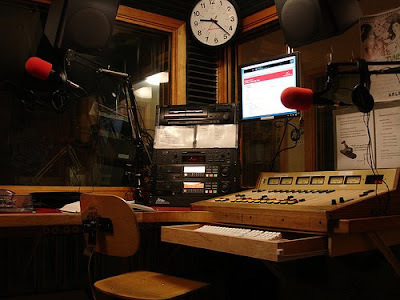 As we'll see in future posts, radio did continue at Haverford after WABQ was sold off, but it had its fair share of ups and downs depending upon the enthusiasm and technical skills of the students at the time. Many thanks to Haverford College Communications Office Intern Heather Harden for her help in tracking down copies of vintage yearbooks for me and for her fantastic research assistance. Images from the Haverford College Record were provided by her and came from the collections of the Alumni Relations and Annual Giving Departments at Haverford College. Additionally, thanks to Diana Peterson from Haverford's Magill Library. She's the Special Collections maven and has been a great help to me in securing old WABQ, WHAV and WHRC materials and was responsible for bringing many of the old WABQ photographs to my attention. Coming up next...Haverford College radio in the 1930s. Way back in the early days of radio, dramatic productions were a staple of the medium. Families would gather around and listen to stories together in the evening. Even when I was a kid in the 1970s, I would listen to old radio dramas like "The Shadow" late at night in my room as I was falling asleep. Today, you'll be hard-pressed to find radio stations playing radio drama. WNUR at Northwestern University is an exception, as they have a weekly radio show devoted to radio drama. 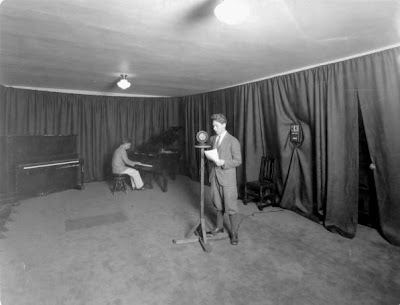 Northwestern University Radio Drama (NURD) works from scripts written by students, both past (from as far back as the 1940s) and present. Additionally, the station where I DJ, KFJC, has aired a number of radio dramas and serials over the years. When I first joined around 1998, DJ Nora Maki was at the helm of a weekly serial called "Hades Ham Journal" that aired every Friday night. In 2001, a group of us under the direction of DJ Thurston Hunger performed Lauri Bortz's play "Skirting the Issue" live over the air as a radio drama. So, I applaud Vernae Williams for diving into the world of radio drama. Starting in September, her ongoing serial "Like Us," will be coming to college radio stations around the country. Using a very short-form format (60 to 90 second episodes), the series will focus on the friendship of three teen girls in Atlanta and the struggles that they face. As with any proper soap opera, she promises: Hookups, Secrets, Lies, and Deceit! Vernae told me that she was inspired to create a series focusing on young African-American women because she felt like their experiences were not portrayed in mainstream media. As she's gearing up for her radio debut, she began her radio outreach with stations at Historically Black Colleges and Universities (HBCUs), although she told me that the series will have appeal beyond the African-American community as its themes touch on issues relevant to all young people. So far she has around 11 college radio stations lined up to air "Like Us," including stations at Albany State (WASU), Alcorn State, Delaware State (WDSU), Grambling State (KGRM), and Howard University (WHUR). She's hoping to launch with at least 20 stations, so if you're interested, be sure to get in touch. I chatted with Vernae recently about her endeavor and why she thinks college radio is the perfect medium for her coming of age soap opera for youth. Spinning Indie: Can you briefly describe "Like Us"? Vernae Williams: "Like Us" is a coming of age radio drama about three girls whose social and personal lives change drastically after an unfathomable tragedy. Spinning Indie: What inspired you to create a radio drama? Vernae: One day I was watching TV and I came across a few shows like "The Hills," "One Tree Hill" and "Dawson's Creek" and I then realized that there were NO shows with an entire African American cast-- therefore our story was not being told. Three years later, I had written a television script and was working with a production company that was pitching "Like Us" to various television networks, but things weren't working out so I decided to end the relationship between me and the production company. When I left the production company I felt as if I was back to where I was three years ago and I didn't really know what to do until one day I was riding down the street listening to the radio and I started to imagine the show as a radio drama. I thought about how Guiding Light started out and the success of Tom Joyner's radio drama "It's Your World" and I went for it. Spinning Indie: Why did you decide to debut it on college radio? Vernae: The college radio market is so untapped and under used. I knew, if promoted and marketed right, bringing "Like Us" to college radio stations would bring great attention to the schools, their stations and the show. Not to mention that "Like Us" is about college students and the things they go through, so the idea of the show being in the home of my market is great. Spinning Indie: How are you finding/selecting stations? Vernae: I started out with HBCU stations, which have been the most supportive. I send out emails, make calls, contact through social networks and also use my personal connections to contact the stations. Spinning Indie: Do you have any "dream" stations that you'd like it to air on? Vernae: I believe each station that is a participating is my dream station. Each station reaches college students and the college students are my target audience. Spinning Indie: What do you love about college radio? radio in general? Vernae: Radio gives you the opportunity to really use your imagination and have fun with your thoughts and the things you're hearing. With college radio I'll have a chance to work closely with those that inspire "Like Us": the students. Spinning Indie: Anything else you'd like to share? Vernae: I am extremely excited and can't until the show airs, which is in late September. If there are any potential stations that are interested in airing "Like Us" or if anyone would like any additional information on the show I can be reached at vernaewilliams@gmail.com. I am also looking for sponsors, so if there are any sponsors interested in supporting "Like Us" please contact me. I have an equal amount of passion for teen culture and indie music culture; so when the two worlds collide it's a safe bet that I will be seek out whatever book, movie, website, 'zine, or piece of music is the resulting product. To learn more about their take on music discovery, music journalism, and what it's like to be young and interviewing rock stars; I had an email chat with Brittany and Zac Rich. I also got some perspective from the author of the book's foreward: Aaron Burgess. 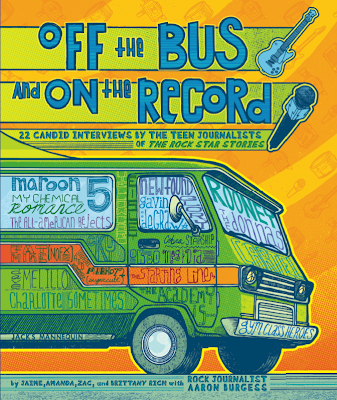 Aaron used to be the editor of indie music staple Alternative Press and he sheds some light on rock journalism across the generations. Zac Rich: A lot of ways. I tune into Pandora and Sirius radio. But also from other bands during interviews [who] will tell you "oh you have to check out this new band, they're really good." Brittany: I listen to Sirius radio in the car and some local rock radio but we don't have a lot of alternative or even rock on the radio in our area. When I move into the dorms this year at college I will probably start listening to college radio. Zac: Being on air makes you have to think really quick on your feet. You have X amount of time on camera and every move you make [and] question you ask gets shown on the tape. So you have to be really focused and able to think quick on your feet. No matter how much you get ready for an interview it won't have any effect if you lock up on camera and forget everything. Zac: I been doing Internet radio for the last 5 years, it's a uncensored talk show aimed at college students. It's nice to be on the Internet because of the freedom of being uncensored and being able to say whatever we want. Zac: Yes! for starters we care more about who and what we're interviewing because most of the time the band plays a role in our lives. Either we hear their music every day or we [or] our friends talk about them every day. Also because a teen or young adult journalist isn't as threatening to a band as a someone from NBC or ABC or MTV. To them we are just fans, but with a great job! This makes most bands open up more and tells us some really great stories. Thanks to the crew from The Rock Star Stories for sharing their passion for music with me! If you've never checked out Jose Fritz's fabulous blog Arcane Radio Trivia, it's worth taking a look as it contains a goldmine of radio-related lore. I just interviewed Jose Fritz over on Radio Survivor, so head on over if you want more juicy details on his fascination with non-commercial radio and his love for college radio. "I had heard rumors for years of unspecific wildness, of a rowdy past of punk rock and college kids. WXPN wasn't always a monument to middle-aged blandness. Once, long ago they were a wholly different station. Finally I bumped into the history of a little carrier current station WQHS. Their story is also the story of WXPN." "...everything changed. the students were kicked out good and bad alike. The University decided to re-staff and re-build WXPN as a more commercial entity. It had paid staff, a format, and no damn kids. The course of history had been change forever by a dirty joke." Crazy...But the good news is that student radio still lives at University of Pennsylvania at online station WQHS. When I wrote my recent profile of Carleton College radio station KRLX, I was made aware of a new service coming to Taiwan on September 1st called Oh! Zone. KRLX will be one of the many English-language college radio stations being featured on this online radio station oriented towards students in Taiwan who are interested in studying abroad. I'm always very interested in any sort of concerted effort to celebrate college radio culture and this seems like a very ambitious project. On their website you can take a look at some of the sample programs from participating stations, including some from the U.S., Canada, UK, Australia and New Zealand. Their website lists approximately 25 U.S. stations including WXPN (University of Pennsylvania), KEXP (University of Washington), KBCS (Bellevue College), WVUD (University of Delaware), KVCU Radio 1190 (University of Colorado, Boulder), KLPI (Louisiana Tech), KLCZ (Lewis-Clark State College), WWSU (Wright State), KUSC (University of Southern California), WGWG (Gardner-Webb University), WLNZ (Lansing Community College), WNCW (Isothermal Community College), KUCI (University of California, Irvine), KUNM (University of New Mexico), KPLU (Pacific Lutheran University), KUT (University of Texas, Austin), KTBG (University of Central Missouri), Radio K (University of Minnesota), WLRA (Lewis University), KBVR (Oregon State), WUOG (University of Georgia), WODU (Old Dominion), KTUH (University of Hawaii, Manoa), and WXJM (James Madison University). According to a letter sent by OhZone Program Director Jon Roberts to participating schools, "The OhZone is a collection of English-language campus and Community radio stations from around the world. We are a free English-language tool for Taiwanese listeners. Our target audience is Taiwanese students wanting to study overseas. We provide them a choice of music and accents to listen to while researching universities." I've heard some buzz recently from schools who were contacted by OhZone and there seems to be some confusion among the U.S. radio stations about whether or not their radio programs can be re-broadcast by other entities online or oversees and what the ensuing licensing implications may be. According to OhZone, "We have obtained a certificate from the music licensing authority here MUST - meaning we can legally rebroadcast programs - and we pay the royalty fee." I was told by OhZone that participating stations are required to provide playlist information to them so that they can fulfill licensing and royalty requirements. In any event, it's a cool idea to set up a 24/7 schedule that is peppered with specific content from radio stations from all over the globe and it's the first time that I've heard of college radio being highlighted in such a way. Other similar attempts have included XM Radio's "Student Exchange Program" (where different college radio stations curated 2 hours of programming on satellite radio station XMU) and the "College Radio Tuner" for the iPhone (featuring streams from IBS member stations); but I haven't seen something like Oh! Zone before, where specific programs are hand-picked for the schedule. To learn a bit more about Oh! Zone I conducted email interviews with a few of the folks responsible for developing it, including Brian Hockertz, the Director of the Oh! Study Education center, and Program Director Jon Roberts. I was surprised to find out that college radio is just one part of a whole promotional program for study abroad. Who knew! Spinning Indie: I'm curious about how came up with the idea for Oh! Zone? Brian Hockertz: I started developing the concept of the Oh! Zone almost two years ago in response to a need to create a medium to promote overseas schools, study abroad and also a way to promote learning English and create a better understanding of western culture in Taiwan. We wanted to create a community of listeners that will stick with us over time and we could provide them with high quality programming coming from campus radio stations to give a taste of life on an overseas campus. FYI, the Oh! Study Education center is the largest overseas education promotion and student travel center in Taiwan. Spinning Indie: Why do you find college radio to be a compelling way to share the experience of campus life? Brian: We promote overseas campuses in many ways, such as publications, web content, exhibitions, local campus outreach, etc. We also have extensive experience running promotions on several local radio stations and were aware of the effectiveness of this medium. The Oh! Zone seemed like the a logical step for us to take in the development of our activities in Taiwan. Additionally, establishing a radio station allows us to provide a greater variety and diversity of content from around the world to our audience in Taiwan, and give them a better feel for life on an overseas campus. Spinning Indie: Do you have a background in radio? college radio? Brian: Personally, no, with the exception of conducting many promotional activities and being a regular interviewee on local radio stations. However, both Jon and a new addition to our team, Rick Monday have extensive experience in the radio industry. Rick will be taking over as our Program Director and Jon will remain with us in a consulting role. Rick has close to 40 years in the radio industry and he is the only foreign DJ in Taiwan to have won a Golden Bell Award (sort of like an Emmy). Spinning Indie: How are you determining the program schedule? Brian: I provide a little direction in terms of general themes and direction of the programming, but Jon and Rick are the ones crafting the final schedule. We are trying to create a program schedule with a broad variety of different programs reflecting overseas campus culture. At the same time, we have to create appropriate content for different days (i.e., week day vs. weekend) and times during the day to match the audience that will be listening. As we are a non-commercial station, we have a lot of leeway in terms of being able to create a program schedule that suits the needs of our audience and station rather than advertisers. Spinning Indie: Are you focusing on music programming only or will you also include talk shows, sports, etc? Brian: Most of the programs will have a mix of DJ talk and music, but we already have several talk shows, such as a vegan cooking show, a tech show, movie review show, etc. A bit of an eclectic mix. Spinning Indie: How are you selecting stations and who has joined up? Brian: Usually it has been based on two different criterion: first, we have approached schools that are working with our student counseling/travel center to see if they would be interested in participating in the Oh! Zone, and second, we have been searching for high quality programming from all campus radio stations that would fit into our schedule. Spinning Indie: Tell me more about "Women Rule Night." Brian: Jon and Rick could probably tell you more about this, but we thought it would be a good way to show diversity on campuses and reach out to a female audience. Sometimes, female issues/performers take a bit of a backseat in Taiwan, and we wanted to be able to spotlight them on the Oh! Zone. Jon Roberts: Both Rick Monday and I had strong willed mothers and sisters. The rule in our homes was "if men would listen to what we women say you won't go wrong so often." Plus, female announcers have always been well received in Taiwan. The first shows submitted to us were from CHLY (the voice of the VIU campus): In the Red and Pandemic Pulse. Both have female announcers and both received great comments when we tested the OhZone on Taiwanese. Rick and I wanted to create a format that ensured those CHLY announcers would always be on the OhZone as well as a format that reached out to other female announcers. We're expecting big things from Women Rule. Spinning Indie: Is there college radio in Taiwan? How does it compare to U.S./Canada/European campus radio? Brian: It exists, but it is not very well developed. Usually, the stations would be directly attached to a university journalism/mass comm department and programming is a part of the curriculum. Thanks to the Oh! Zone folks for talking to me about their venture. It will be cool to see how all the programming shapes up as of September 1st. I finally tracked down a physical copy of the Princeton Review's "Best 371 Colleges" guide for 2010 as I was obsessed with figuring out which college station was the lucky #3 in their "most popular college radio stations" listing. So. Mystery solved. Seton Hall gets the honors this time around. They were inadvertently left off of the online list, so hopefully fame is now restored to their radio station WSOU 89.5 FM; indeed a very popular hard rock/metal station with 60+ year history on FM. KPSU Gets "Radio Sticker of the Day"
I love it. There's a whole site devoted to radio station stickers and a number of them are from college radio stations. Featured this past week was KPSU from Portland State. Congrats! University of Queensland just started up a new student radio station in Brisbane, Australia in May. An article about the station states that, "...the station was moulded by the student body to appeal to those aged 18 to 24..." and that it's already become quite popular with students both as listeners and DJs. Music blog Rollo & Grady just did a "radio ping pong" experiment with commercial freeform radio station KHUM, in which the DJ and the caller took alternating turns in making musical selections for 2-hour show. Interesting idea, especially for a commercial station. I wonder if there were any selections that the radio station didn't have? I'm so excited to resume the Spinning Indie 50 State Tour with another virtual visit to an impressive college radio station. The goal of this project is to do interviews with college radio stations from each of the 50 states in order to highlight some of the amazing things happening in college radio in every corner of the country. The first nine virtual stops have been to stations in Arkansas, Wisconsin, Kansas, Louisiana, Alaska, North Dakota, Nevada, West Virginia and Kentucky. For my 10th stop, I "traveled" to Minnesota to learn about Carleton College radio station KRLX 88.1 FM in Northfield. The station first got on my radar when I was doing research about the very early days of college radio. I found a 1926 New York Times article, "Colleges Organize for Broadcasting," in which Carleton College faculty member Dr. C.A. Culver was cited as being one of the leaders of a new college radio organization. At the time the Carleton station was known as KFMX. According to the 1937 book Education's Own Stations, Carleton College station KFMX was licensed in December 1923 and began broadcasting January 16, 1924. 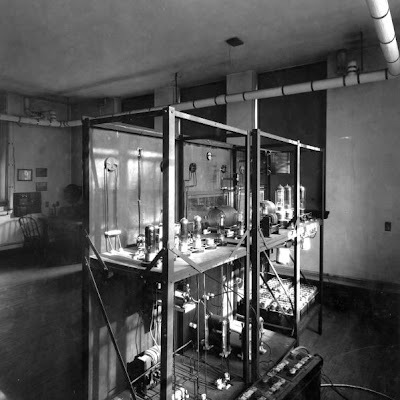 After a series of frequency shifts, issues over time-sharing the same frequency with both college and commercial stations (WRHM, WCAL, and WLB), and interference with another station, KFMX decided to go off the air in 1933 and "the rights to the station were turned over to the University of Minnesota and St. Olaf College...the time divided by the Federal Radio Commission among the two remaining educational institutions and WRHM." During this period in radio there was much discussion about commercial stations squeezing educational stations off the dial and Culver said at the time (as quoted in Education's Own Stations), "...there are almost unlimited educational possibilities inherent in broadcasting...these possibilities can never be realized until the Federal Government sets aside definite frequencies for the exclusive use of educational institutions." According to the KRLX website, radio came back to Carleton in 1948 with the AM carrier current station KARL. In 1974 the station was granted a license to broadcast over FM and KRLX was born as a 10 watt station at 90.3FM. In 1983 they got upgraded to 100 watts and moved to 88.1FM. Today, KRLX is a freeform station and is the biggest student organization at Carleton with around 250 folks on staff. What's even more amazing is that Carleton is a small (less than 2000 students) liberal arts college, meaning that 25% of students play some role at the college radio station. To learn more about how a station with such rich history continues to thrive every year, I talked to Station Manager Gabe Silberblatt. In our email interview Gabe spoke about KRLX's upcoming broadcasts in Taiwan, their coverage of the Pitchfork Music Festival, their vintage vinyl collection, the station's close connection with long-time campus pub (since 1927) The Cave, and their role in the broader community of Northfield, Minnesota. Spinning Indie: I understand the station is off the air for the summer. What are you guys working on over the summer? Gabe Silberblatt: At the end of the last academic year, KRLX received a very large some of money from Carleton to enable a big IT modernization project. Over the summer we have been ordering and installing new equipment, as well as making structural improvements to our facilities. We have also just finalized plans to join forces with an American web-radio organization in Taiwan that re-broadcasts American radio programs for college-aged students who want to study abroad. (here is their beta site: http://ohzone.org/program.php) The organization will begin re-broadcasting KRLX content in Taiwan this coming fall. We also did extensive coverage of the Pitchfork Music Festival, to which we were given press passes. Spinning Indie: When does broadcasting resume? Spinning Indie: Are shows already scheduled for the fall? What does the programming schedule look like? Does it change dramatically every semester or do you have any long-time shows? Gabe: No. KRLX is an entirely free form station at heart, so the programming changes depending on student involvement and interest. The programming for each trimester happens the first week of the term. That being said, we have many individuals who maintain a show from term to term in a regular time slot, sometimes for years at a time. The news is always a staple, with 5 minute recorded segments at the top of the hour between 6am-5pm and a live 15 minute broadcast recapping the major stories at 10pm every weeknight. Ultimately though, the content changes a great deal from term to term, especially in the fall, when all new freshmen come to the station. Spinning Indie: For such a small school, I'm really amazed that you have 200 staff members and DJs. How do you draw so many people to the station? Is it all students or can community members participate? Gabe: KRLX is student run from the top down. We have no professional or paid employees working there, which I understanding is exceedingly rare for college stations. There are actually more than 250 students working at KRLX in some capacity, be it as a DJ, news anchor, promoter, record librarian, technician, web manager, or any combination of these. KRLX is easily the largest student organization on campus, with almost a quarter of the school involved with the station in some way. There always seems to be a great deal of natural interest in the station from students, who volunteer their time willingly. Perhaps students are attracted to the station's extremely flexible and free form programming. We do have a wonderful promotions director and team who help make the station visible on a day to day basis and get the word out about promotional events on campus. As I understand, there may have been community members participating in the past, though none currently work with the station. We do occasionally have a faculty member host a show or appear as a guest on a student's show. We're certainly open to the idea of having non-students serve non-leadership roles at KRLX. Spinning Indie: Carleton College has a really impressive radio history. I just learned that an early station there called KFMX was licensed in December 1923 and began broadcasting in January 1924 through 1933. Are people at the station aware of this early history? Gabe: It is a source of pride for the board of directors at KRLX, but the majority of students at Carleton, or in the town of Northfield for that matter, are not really aware of this history. Spinning Indie: How is station history preserved at KRLX? Gabe: In terms of content, only a portion of the shows are recorded and saved. These are typically talk or specialty shows or extended new coverages. Spinning Indie: I hear that you have records in your library dating back to the 1940s. Do DJs play these early records? Gabe: Absolutely. Though less and less students are familiar or comfortable using vinyl in the studio, we have several shows that play exclusively vinyl from the record library in addition to DJs who play from their own collections. Spinning Indie: Does the station play a role in the broader community and music scene surrounding the campus? Gabe: Our 100 watt frequency reaches the larger Northfield area, and we know from surveys that businesses tune to the frequency. We also frequently get phone calls and messages from residents, which suggests they use the station as well. KRLX is very tied to the on-campus bar and music venue called "The Cave," which I believe is the oldest student-run pub in America (est. 1927). We host events there and broadcast them live on air. We also cover concerts and promote local artists on air. Typically, those students who work and attend Cave events are also very involved with the radio station-- there is a great deal of overlap and dialogue between the two. Gabe: Like I said, the station is completely free form, so eclecticism is encouraged on all levels. We try to encourage DJs to play music that would normally never be heard on broadcast radio, but at the end of the day, the content of an individual show is designed by and for the students involved, and they are free to play pretty much whatever they please. 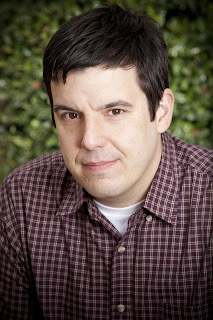 Gabe: Adding music is the painstaking job of two music directors and a small team of associate music directors. 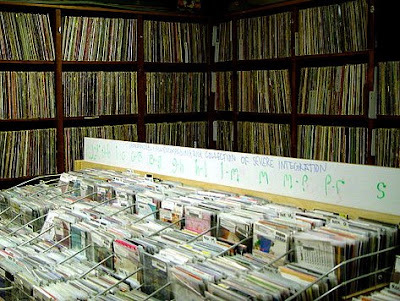 Of the thousands of albums that get sent to the station each year (vinyl, CD, digital) only a portion make it onto the air and into the record library. Each week a computer in the FM studio is updated with "new music" that has been added to the station. DJs are required to play and identify one piece of this new music for every hour they are on the air. Because there is a variety of new music available for DJs to choose from, this practice enables the station to promote specific artists that the student body enjoys or artists that may be coming to play concerts there. The only things that DJs are not allowed to play are songs that don't comply with FCC requirements. Gabe: We have the capability to rip vinyl, and frequently we will make a CD copy of a vinyl record for the record library. We have started to receive more and more music in the form of mp3s from both independent and corporate record labels. We definitely add this music to the station computer and record library. Part of the IT modernization plan budget is to increase the capacity and quality of our digital music storage so that we can continue to collect and preserve this format as it becomes increasingly ubiquitous. Thanks again to Station Manager Gabe Silberblatt for taking some time out of his summer to chat with me by email about KRLX. Keep your fingers crossed for the timely posting of future installments of the Spinning Indie 50 State Tour.